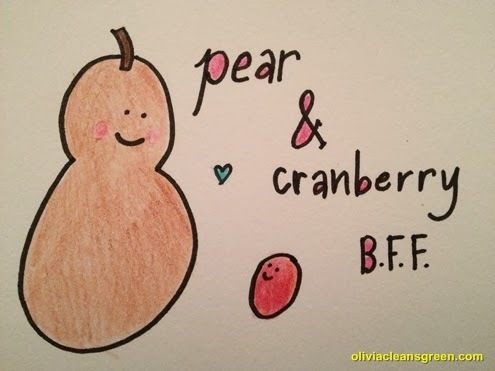 Most of us are no stranger to the pear-cranberry connection. Every autumn, we begin to find it in pies, granola, stuffing, even cocktails. It's the t-shirt and jeans of cool season foods: pretty darned awesome but so classic it can easily be taken for granted. But this a combination to truly be grateful for. Pears have a tremendous amount of fiber and aren't too shabby with the vitamin C either. Cranberries have high concentrations of vitamin C, dietary fiber, manganese and vitamin K and help prevent UTIs. Let's celebrate the combination of sweet and tart with this warming cranberry pear steel cut oatmeal that will make you fall in love with the pairing all over again. Stir in oats and keep stirring for about 1-2 minutes. Turn down heat to simmer, uncovered. Core and chop pear into bite sized pieces. It doesn't matter if they aren't uniform. 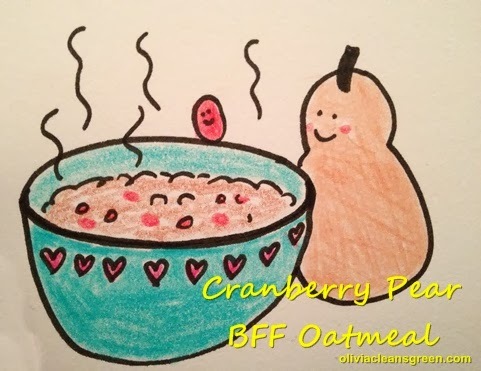 Stir pear and cranberries into simmering oats. Once most of the water is absorbed and it's the consistency you like, you're done. Spoon into two bowls. Stir a teaspoon of ground flax seeds into each bowl. Top with a some roughly chopped walnuts and three supershakes of cinnamon. If the pear is ripe and you use enough cinnamon, you probably won't crave sweetener. However, if you must have it, a fairy dusting of brown sugar is a nice flavor to add. Please promise me you'll try it without sugar first though. Share with your best friend forever. If you're not sharing, save half for later in the week. Reheat with a splash of unsweetened vanilla coconut or almond milk over low heat. * While cooking this oatmeal, you'll also need something to do for 30 minutes that doesn't require concentration. Clean out the fridge or cabinets. Update the grocery list. Or, if I may suggest, use the social share buttons here to tweet that you're making the best oatmeal ever! Or better yet, use the social share buttons to email this recipe to your BFF. Do you like cranberry pear combinations? What's the most interesting way you've seen or tasted the two together?